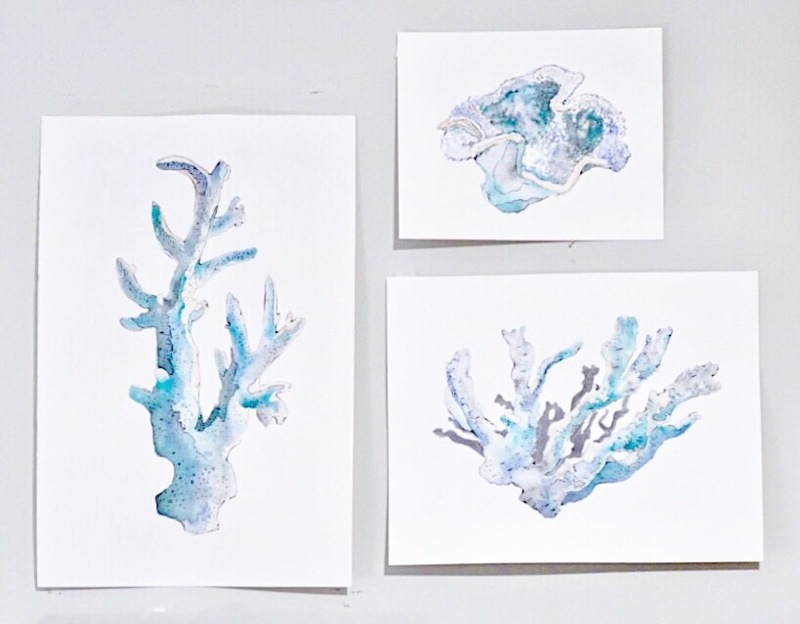 I finally finished the coral paintings I have been working on for the past few weeks! I tried to get a time lapse of the largest painting, but frankly it was my first time every trying to do a time lapse and it was a massive fail. Hopefully the next time, there won't be an embarrassing amount of tape strapped to my phone just to keep it upright. One of these day's I'll get it, but today was not that day. Anyways, back to the coral. I'm going to be giving the paintings to the client at some point this week. I want to get pictures of them up in her nursery, especially in frames. Paintings always look so much cleaner and complete in frames. I was really pleased with how these turned out. I like the hints of blue/green mixed in with the neutrals of the gray. Plus the variations in the coral themselves are really visually interesting to me. Overall, they come together to form a successful composition. The largest one on the left is 12x18", followed by 11x14", and an 8x10". Each were completed in watercolor and finished off with some details in pen. Let me know what you guys think of them!